Overview: IPRU is the largest private sector life insurer in India. IPRU offers a good range of life insurance, health insurance and pension services. IPRU had revenues and profits of Rs 18,999 cr. and Rs 1,653 cr. resp. in FY16. 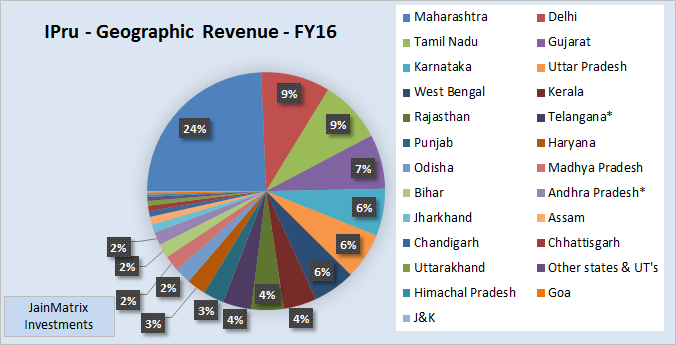 Its revenue and PAT have grown just 8.1%, and 4.5% CAGR from FY12 to FY16. The industry is getting over a number of regulatory and structural changes by regulator IRDA. IPRU has made impressive strides with ecommerce and strong sales network, improving productivity and proactive customer service. However there are a few risks: 1) Changes in the regulatory environment 2) IPRU is subject to claims by the customers and/or regulators for mis-selling. High valuations make this IPO attractive only for long tern investors. It is rated a low risk, medium return type of offering. Opinion: Investors may BUY IPRU with a 3 year perspective. Here is a note on ICICI Prudential Life Insurance Company (IPRU). This IPO is the biggest since Coal India’s market debut in 2010. Shares offered to public: 18.13 crore out of which 1.81 cr. are reserved for ICICI bank shareholders. The FV of each share offered is Rs. 10 and the market Lot is multiples of 44. Shares offered are 12.63% of equity. The IPO will collect Rs 5,451 cr. (at upper band) which is a sale by promoter ICICI bank; there is no fresh issue of shares. The IPO shares are available to institutional, non-institutional and retail in ratio of 50:15:35. ICICI bank holds 67% stake of IPRU. Post IPO shareholding will be ICICI Bank 55%, Prudential Corp 26%, other investors 6%, and in IPO – QIB 6%, retail 4%, NIB 2%, ICICI Bank s’holders 1%. The beneficiary of the IPO is promoter ICICI Bank which will unlock value in this firm. IPRU is the largest private sector life insurer in India. It is a JV between ICICI Bank and Prudential Corp. The vision is to be a dominant Life, Health & Pensions firm. IPRU had revenues and profits of Rs 18,999 cr. and Rs 1,653 cr. resp. in FY16. 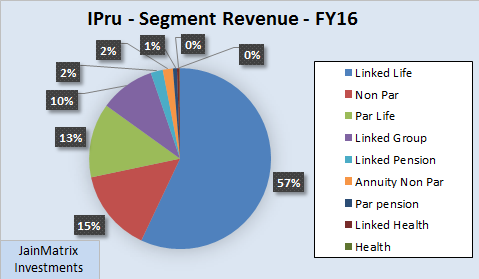 Its revenue and PAT have grown 8.1% and 4.5% CAGR from FY12 to FY16. IPRU was one of the first private sector life insurance firms and started operations in 2001. In FY16, their market share among all insurance companies in India was 11.3%. Among the 23 private life insurance companies in India, the share of 21.9%. In FY16, IPRU’s gross premium income was Rs 19,164 cr., which comprised Rs 4,924 cr. of retail new business regular premium, Rs 432 cr. of retail new business single premium, Rs 11,995 cr. of retail renewal premium and Rs 1,813 cr. of group premium. Also see Fig 1 for product wise details. IPRU has a 100% subsidiary, ICICI Prudential Pension Funds Management, which is registered as a fund manager with the Pensions Fund Regulatory and Development Authority of India. IPRU’s 13th month persistency ratio in FY16 was 82.4%, which was one of the highest in the sector. As on FY16 IPRU had Rs 1,04,000 lakh cr. of AUM. Their expense ratio of 14.6% for FY16 was one of the lowest among the private life insurance cos. in India. IPRU sells its products through a multi-channel network which includes own branches, sales employees, promoter ICICI Bank branches, sales agents, corporate agents, and own website. In FY16, IPRU had 121,016 individual agents and their bank partners had 4,500 branches. IPRU had a strong capital position with a solvency ratio of 320% in FY16 compared to the IRDAI-prescribed level of 150%. The claim settlement ratio was 96.2% for FY16, up from previous 94.1% in FY14. The grievance ratio was down to 153 for FY16 from earlier 253 in FY14. Leadership: Sandeep Bakshi is MD-CEO; Sandeep Batra is ED (corp.); Puneet Nanda is ED (business). ICICI Bank is a firm providing a range of banking and financial services, including commercial banking, retail banking, project & corporate finance, working capital, insurance, venture capital and private equity, investment banking, broking and treasury products and services. It is the largest private sector bank in India. Income, PAT and EPS grew by 11.1%, 7.4% and 7.1% CAGR resp. over 5 years. Due to a fall in share price and EPS, P/E ratio fell to 13.59 times. See Fig 3. 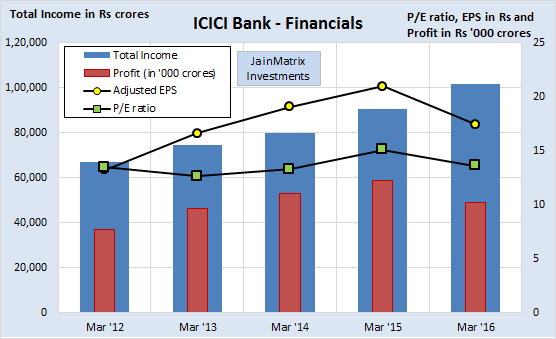 ICICI Bank has a high net profit margin of 17.2%. The current dividend yield for ICICI Bank stands at 1.86%. The RoE stands at 12.42%. This is average performance. Prudential Corp. Holdings Ltd is likely to trim its stake in IPRU by up to 5.8% after the listing. As per the revised terms of their JV agreement, ICICI Bank and Prudential have agreed to reduce stake in IPRU to achieve minimum public holding norms with a floor of 54% and 20% resp. IRDAI has proposed that life insurers need to list their shares after 10 years of operations. But insurers are apprehensive and claim that when they started up, this was not a pre-condition. HDFC and Max Group announced a deal merging their life insurance businesses to create what may become India’s largest listed life insurance firm with an estimated market value of Rs 67,000 cr. once the all-share transaction is completed. In this merger the value for HDFC Life Insurance was Rs 47,000 crore with market share of 7.6% against IPRU’s share of 11.3%. As per an article IPRU offers the best online insurance plans with a good variety of policies. As per the management, 90% of their retail business premium comes via the digital mode. The IRDAI recently said that insurance portability will be the next big initiative for the industry. The portability (of insurance) is possible currently only if the policy is standardised. The regulator will assess the pros and cons of introducing the same. Employee productivity improved, measured as retail weighted received premium per employee per annum, from Rs 28 lakhs in FY14 to Rs 46 lakhs in FY16, representing a growth of 29.1% CAGR. IPRU sold a 6% stake in Nov 2015, for Rs 1,950 cr., valuing the company at Rs 32,500 cr. The IPO, however, values it at Rs 47,870 crore at the upper band, a 47% rise in 10 months. Ahead of its IPO, IPRU is believed to have allotted shares worth Rs 1,635 cr. to a clutch of investors, including Singapore Govt,. Nomura and a pension trust for Boeing employees. IPRU believes that they are adequately capitalized for now, but may raise debt in future. The unofficial/ grey market premium for this IPO is in the range of Rs 17 – 18. This is a positive. The size of the Indian life insurance sector was Rs 3.7 lakh crore on a total premium basis in FY16, making it the 10th largest life insurance market in the world and the 5th largest in Asia. There are 55 insurance companies, of which 24 are in life and 30 in non-life, and one reinsurer. The total premium in the Indian life insurance sector grew at a CAGR of 17% between FY01-16. Despite this, India continues to be an underpenetrated with a life insurance penetration of 2.7% in FY15, as compared to 3.7% in Thailand, 7.3% in South Korea and a global average of 3.5% in 2015. In 2015, the GoI increased the foreign investor max. shareholding from 26% to 49% of paid-up equity capital. This led to a foreign investment inflow of US$1.13 bn in FY16, a 170% YoY increase. 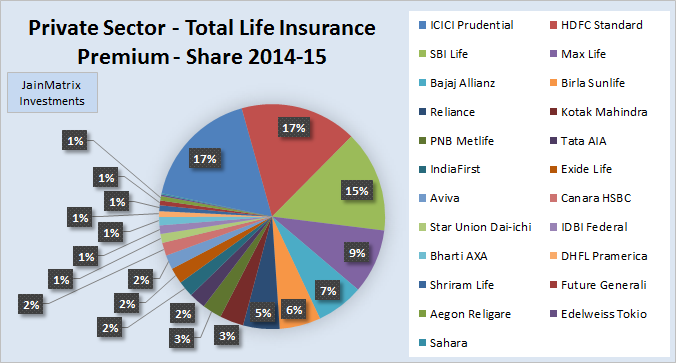 LIC with Rs 2,39,668 crores of Total life insurance premium in FY16 still has 73% market share. Since the opening up of the sector, private sector companies have gained market share, which peaked at 57% in FY09, on a Retail Weighted Received Premium (RWRP) basis. The financial crisis in 2008 and regulatory changes in FY10 resulted in loss of market share, to 37% in FY12. But they have recovered in the last 2 years, increasing share from 38% in FY14 to 52% in FY16. The growth in market share was been driven by improved product design, focus on equity linked products that offer flexibility and superior customer value propositions and distribution. Private sector firms have also increased their focus on bancassurance for marketing their products. Profitability of the sector fell recently as under new IRDA rules, the corpus of lapsed or surrendered policies goes into a discontinuance fund that returns the money to the policyholder on completion of five years after deduction of surrender charges that are lower and capped. The sale and servicing of insurance policies on e-commerce sites may start in Oct 2016 (IRDA). The insurance sector is growing well – health insurance is expanding at 31%. The life and non-life insurance segments are expanding at about 15%, per a senior executive. ULIPs accounted for 92% and 75% of the new business premiums for private sector companies and the overall industry, resp. in FY08. The unit-linked product regulations introduced in Sept 2010, and growth in the equity markets led to expansion in this category. In recent years, the commissions on ULIPs was reduced, which was a challenge to distributors (and agents). This resulted in a decline of the share of equity linked products in the life insurance sector from 55% to 7% and from 83% to 29% for private sector firms in FY14. The demand revived in FY15 and the new business premium for linked products increased by 54.9% for private sector. The GIC Re is the 14th largest reinsurer globally and is the only reinsurance company in India. Several global reinsurance firms are expected to set up soon in India. The revenue growth is moderate, and profit margins fell until FY16. See Fig 5. The EPS growth has been slow from FY12 to FY16. From Q1FY17 data, financials are not good. However in reality, Q4 every year is best for insurance, as customers focus on tax savings. The dividend has been rising over the years. IPRU paid a dividend of Rs 8.4 in FY16, a yield of 2.51%. This is a positive for investors as it is the highest in the industry. 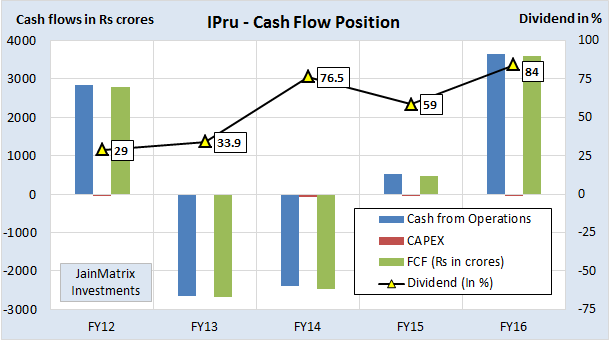 IPRU has been able to generate Free Cash Flow for 3 of the last 5 years, a positive, see Fig 6. IPRU has a ROE of 31.2% (FY16) making it the best in the industry. The cash per share including Reserves & Surplus and Cash in balance sheet as on June 2016 is Rs 29/share. So the current operations of IPRU are available at (334-29) = Rs 305/share. (At UMP). We benchmark IPRU against a listed peer Max Financial, and Bajaj Finserv & HDFC (Holding companies of firms including insurance) and other BFSI firms. See Fig 7. 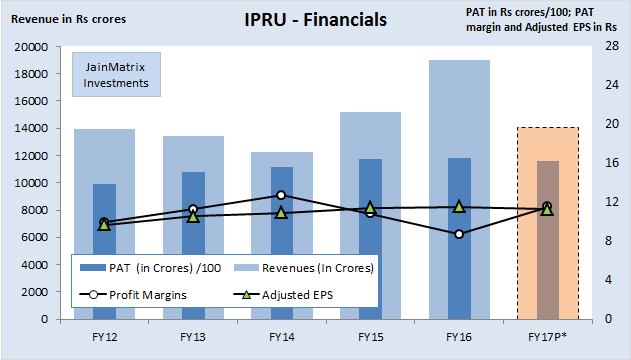 IPRU appears to be available at high valuations in terms of PE and P/B. Max Fin. Serv. is higher but profits are very low, so it is not comparable. Highest ROE and dividend yield amongst peers is a differentiator and a positive. Margins and growth are low indicating both high competition in the industry, and the effect of IRDA regulatory changes, however they are improving. IPRU is the leader among the private sector insurance firms. It has built on the strong ICICI Bank franchise, which gives it bancassurance and distribution & customer access. It has built a diversified multi-channel sales distribution network. IPRU has a comprehensive and customer friendly product portfolio, so offers a good choice. IPRU has consistently generated the most new business premiums among private life insurers in India since FY02, and market share increased from 5.9% in FY12 to 11.3% in FY16 (CRISIL Research). IPRU has responded successfully to the rapid regulatory changes since 2010. With a strong technology and ecommerce platform, IPRU is improving revenues and productivity. IPRU has a strong senior management team experienced in life insurance. The CEO Sandeep Bakshi has 32 years of experience in BFSI. 28 of the top 36 members of the management team have worked within the ICICI Group for over 10 years and have an average work experience of 20 years. Insurance is a long term financial product, and the demand for this depends on awareness, financial education and planning. However most consumers do not think long term. A falling interest rate will have a negative effect on IPRU business and profitability. About 53.5% of their investments are in debt securities, and the returns from this will fall. IPRU is subject to claims by the customers and/or regulators for alleged mis-selling. Changes in the regulatory environment in India could have a material impact on their business. Any epidemic (medical) or natural disaster (floods, earthquake) can massively impact claims and hence profitability. The Indian insurance market has experienced volatility in growth and the future is uncertain. However given low penetration and awareness, this industry is expected to grow rapidly. IPRU’s business is substantially affected by prevailing economic, political and such conditions. The Insurance sector is at an early stage in India with low penetration and awareness. It has also been besieged with regulatory changes and many complaints of mis-selling. The good news is that a troubled phase may be behind us, and with favorable demographics the future looks more stable. The sector dominator is govt. owned LIC, and it is easy to imagine that a nimble private sector may gain market share against LIC over the next few years. Given the leadership status of IPRU, and its strong brand, we are positive about the firms prospects. At a FY16 PE of 29.0 times and P/B of 8.99 times, the valuations are expensive. There are a few risks listed above that must be understood. We feel this offering is attractive only for investors with a minimum 3 years perspective. As an investment, the IPRU IPO is rated a low risk, medium return type of offering. Investors may Buy IPRU with a 3 year perspective. This document has been prepared by JainMatrix Investments Bangalore (JM), and is meant for use by the recipient only as information and is not for circulation. This document is not to be reported or copied or made available to others without prior permission of JM. It should not be considered or taken as an offer to sell or a solicitation to buy or sell any security. The information contained in this report has been obtained from sources that are considered to be reliable. However, JM has not independently verified the accuracy or completeness of the same. Punit Jain is a customer of ICICI Bank (savings account) and of IPRU (life insurance policy). Other than this, JM has no known financial interests in ICICI Prudential Life Insurance Company Ltd. or any group company. Neither JM nor any of its affiliates, its directors or its employees accepts any responsibility of whatsoever nature for the information, statements and opinion given, made available or expressed herein or for any omission therein. Recipients of this report should be aware that past performance is not necessarily a guide to future performance and value of investments can go down as well. The suitability or otherwise of any investments will depend upon the recipient’s particular circumstances and, in case of doubt, advice should be sought from an Investment Advisor. Punit Jain is a registered Research Analyst under SEBI (Research Analysts) Regulations, 2014. JM has been publishing equity research reports since Nov 2012. Any questions should be directed to the director of JainMatrix Investments at punit.jain@jainmatrix.com. And how you can profit from it. Get my reports and articles first, right in your inbox – subscribe for free to this blog, on the right hand side panel. We’re hearing the term ‘Demographic Dividend’ bandied about quite a bit, when describing India. What does it mean, and what are the implications? In the last 10 years India has added 181 million people to its population. The population of India, at 1,201 billion, is almost equal to the combined population of the US, Indonesia, Brazil, Pakistan, Bangladesh and Japan put together (1214.3 million). India is going to experience this Demographic Dividend (DD) over the next few years. This has a few different forms and implications. There will be fewer kids per family. This means families will upgrade lifestyles, providing better food, education and medicine to the fewer family members. Also, more women will enter the workforce in this period. In the working age of 20-60, people save more, and the economy has more resources freed up to invest in productive loans, projects, infrastructure and industrial asset creating. How do you as an investor gain from this? The Demographic Dividend in India is both a risk and an opportunity. As an investor, your best way to play this trend is to look for the winners on the economic industrial landscape that will gain from this. Here is a group of firms – some winners, some not. Banks Larger Banks are plays on the overall economy. Reserve Bank of India, the regulatory authority, expects average industry growth rate to be 20% during FY11.The banks sector will gain tremendously from the DD. This fast growing bank combines rapid credit growth with high asset quality, hurtling ahead with 30% year on year growth on key parameters. More people with jobs and salaries and growing businesses means continued growth for HDFC Bank. This bank has emerged from a two-year cleansing up of its balance sheet, and has vowed high growth balanced with better asset quality. It already has the widest reach across India in terms of Bank branches. Looks certain to gain from DD. InfoTech/ IT software Indian software services firms started off looking for business all over the world, riding on technology staff shortages and cost arbitrages. The newer trend is to move up the value chain and strengthen sales & marketing in India, to ride on a maturing domestic industrial and services base. This large, well-managed Indian software services firm will gain from DD in the form of controlling costs of skilled software resources. INFY reaches out far and wide across India, hiring top talent. They also come closer by setting up in smaller towns, offering better working conditions, while servicing global customers. Wipro reaches out to customers offering the full suite of software services, BPO and engineering solutions. Expected to gain from DD in terms of controlling resource costs and domestic business growth. This firm has been among the larger players in Indian software services, but has not seen the scaling up associated with the other top players. Nor been able to grow fast in new locations in India. But the acquisition by iGate should see a reversal, and improve the long-term prospects. But in the next 1-2 quarters, there will be higher costs of integration and attrition, before the dust settles. With a corporate restructuring and change of ownership behind it, this firm will hope to resurrect its battered reputation over the next few years. The wheels of justice grind slowly in India, so there’s still uncertainty in the air. This India based automobile major has extended its business from trucks and commercial vehicles a decade ago to passenger cars and SUVs, as well as acquired the marquee brands of Jaguar Land Rover. This acquisition looked expensive 2 years ago, but displayed a stunning turnaround last year.The innovative ‘Tata Nano’ project has stabilized and will gain from DD, offering an affordable safe transportation to middle class Indians. Export plans look feasible and profitable.A slew of new product launches in the commercial vehicles in India helps Tata Motors maintain an astonishing 65% market share in the category. DD drives increases in logistics investments, and TTM is the leader here.Global plans, good technologies and the Indian manufacturing base can make TTM an understated global leader of the future. DD for the Pharmaceuticals sector is very positive as a lot more people spend a lot more on healthcare & medicines. For RDY, rapid growth in domestic business shows this firm is on top of DD trends. RDY should also gain from M&As in a very fragmented domestic industry.Growth from exports also shows the firm is gaining from Indian industry advantages – like lower cost of manufacture, as well as the market opportunity from a number of blockbuster drugs in developed markets going off patent.Recent acquisitions are aimed at growing the global generics business. Some of the above firms will certainly continue to win in the next decade.